A glimpse of what I was thinking at the time. What's one of the rarest occurrences in the world? Not diamonds. It's Joshua Clottey throwing a punch! I caught it on this photograph. Pacquiao gets hit by one of the few punches Clottey gave on this bout. 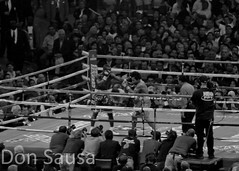 Manny Pacquiao vs. Joshua Clottey, billed as The Event, was a boxing welterweight fight for the WBO World welterweight championship. The bout was held on March 13, 2010, at Cowboys Stadium, in Arlington, Texas, United States. This match was put together after the long awaited "superfight" between Manny Pacquiao and Floyd Mayweather, Jr. had fallen through. Over 50,944 fans were there, the biggest boxing audience in nearly two decades. Added a new form feature that allows you to chat live with me or leave a message (if I'm not available). Click here for contact information. Lost Tomb of Jesus: Is It Fact or Fiction? Copyright 2006-2010 by Don Sausa. Powered by Blogger.